We got the chance to browse the gorgeous beauty counters, ohhing and ahhing over the Hourglass blushes, By Terry powders and Oskia Renaissance Cleansing Gel - a firm fav of Anna and Lily. The girls came across exactly like in their videos, funny, friendly and massive beauty lovers! They kindly answered our beauty questions, I asked them their favourite makeup dupes - Lily recommended the Bourjois Rouge Edition Velvet lipstick as a great dupe for the Sephora matte lip colours. Gonna have to check those out! It was a super fun and chilled out evening, I also got a makeover from one of the makeup artist and she was amazing at recommending products for a flawless and long lasting base. She used the Chantecaille Future Skin foundation, Laura Mercia Oil Free Primer and the wonder product Kevyn Aucoin Sensual Skin Enhancer. She used a light buffing brush and worked the skin enhancer across my face, she said it best to apply lightly and blend it in the skin rather than dabbing it on with your fingers. My skin looked glowy and fresh and concealed my red patches - amazing. Of course we couldn't leave without purchasing a little something, so I stocked up on my trusty REN Clarimatte toner as well as the Laura Mercier primer. 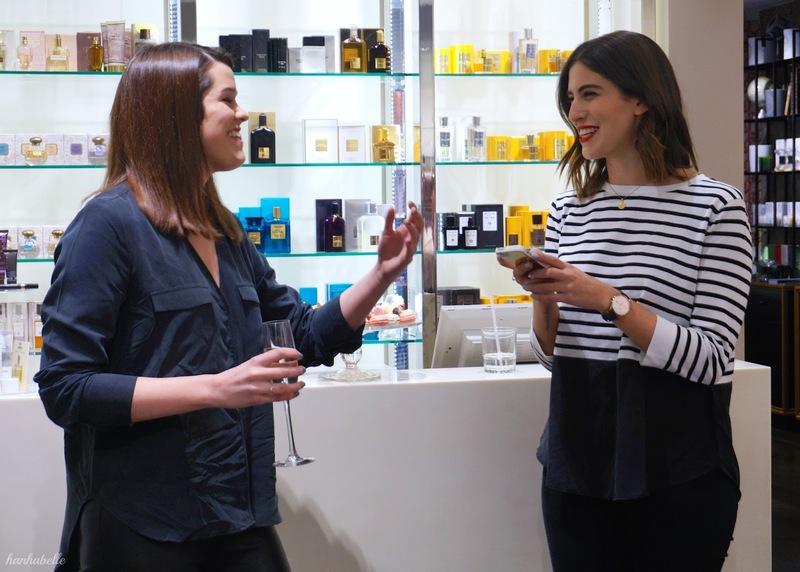 Which beauty bloggers would you love to meet? I am so jelly but you all look stunning together! It makes me so happy they are just as lovely in real life as online - you always hope that is the case but it is so nice to find it is true! Oh myyy! You're one lucky girl to have met these two ladies. Can't deny that I'm a bit jealous, shhtt! Ohhh!! How lucky that you got to meet them, I had no idea that they were on tour! Definitely one of the more informative beauty youtubers out there :) Looks like you had a great time! They are the sweetest people ever, and I would love to meet them in person! It seems like a beautiful venue and you look so pretty! aaahhhhh so stoked that you got to meet them!! You all look beautiful! Wish they'd do a US version of Beauty Chat Live! So is that the Bourjous Velvet on your lips, then? Aaaaah, I'm so jealous! Lily and Anna are pretty much my fave youtubers, they're so adorable and I just love their styles of makeup. I wish they'd make the tour international haha! Thanks girl! Hope you get to meet them one day too! I know that would be amazing! I've got on mac Rebel but love the sound of the Bourjois matte colours. So jelly you get to attend those kind of functions and events! The red lip suits you well, Hanh! I'd love to meet UK bloggers one day (you, for example lol!)! I'd love to have an actual MUA do my base, but at the same time, SO MANY SPOTS AND THINGS TO COVER UP. But it would still be nice to see what I could do better for getting a ~flawless~ complexion. As for bloggers I'd love to meet in RL, yeah, probs Anna. Beautiful photography as always lovely. I absolutely love Lily and Anna, so glad to hear they're as nice as you imagine them to be when watching their video's! PS your lipstick is incredible, what is it? Uhhh I see a beauty on the mirror!!! I'm jealous, the event looks like it was amazing! Anna and Lily seem like such nice ladies. Specially Anna; I'm an Anna fangirl, lol. Haha thanks Carla! Aww shame you didn't get a chance to go the Dublin one? I know right, I was like Anna I love your videos! I've been watching them since you lived in Brighton! What a cool experience! I want them to do an American tour so I can go, hahah. I'm a bit surprised the makeup artist picked up a Kevyn Aucoin product to use on you. His line is perfect and I feel it gets lost in the shuffle of brands like Benefit, MAC, and Bobbi Brown (not that I don't LOVE those brands!). I just think his makeup doesn't get enough attention. Looks like you had a lot of fun though. And again, what a very neat experience. Yes i know, they have so many readers all over the world I'm sure! I agree with you, she raved about the KA skin enhancer, I must admit it did look flawless on my skin.